Created in 2009 by Cherie Barber, Cosmetic Renovations For Profit is Australia’s most comprehensive renovation education program, complete with instant Online Access, a 3 Day LIVE Bootcamp, Home Study Kit, 1-on-1 Mentoring and V.I.P access to exclusive discounts on renovation products and services. Learn to minimise renovation costs, tighten your timeline and maximise profits, whether you rent or sell on completion. With quick cosmetic renovations you can manufacture equity instantly by uplifting your property value as quickly as possible, with as little risk as possible. In a fast-paced and changing market it’s the low risk strategy preferred by many investors and recommended by Cherie. And unlike structural renovations, where the risks and project costs are high and project time frames longer, with the right training you can learn how to cosmetically renovate with little or no renovation experience. Looking to get into the market with your first property? All the more reason to start off with the right foot and avoid very costly beginner mistakes in the short and long term. Did you know that less that only 2% of Australia have more than 3 properties? We teach you Cherie’s success steps. The very same steps she has used to renovate 100+ properties and build her own portfolio. From builders to project managers to home stylists, our courses have helped industry pros grow to the next level to provide more value to clients and increase their personal and property profit success. Cookie cutting takes the guesswork out of budget setting, so you can calculate with reasonable certainty what your renovation will cost, and how long it will take. That is magic in the speculative, risky world of renovating, where fancy design can cause your budget to spiral out of control. The cookie cutter approach is the proven formula for low budget, cosmetic renovations and my recipe for success! Cherie Barber teaches you to focus on your return on investment, taking a business-minded approach from the very start. Learn how to choose the right property and pay the right price, budget and manage your renovation spend so that you don’t overcapitalise … and NEVER, EVER get emotional about the process. You’re not out to win any design awards! 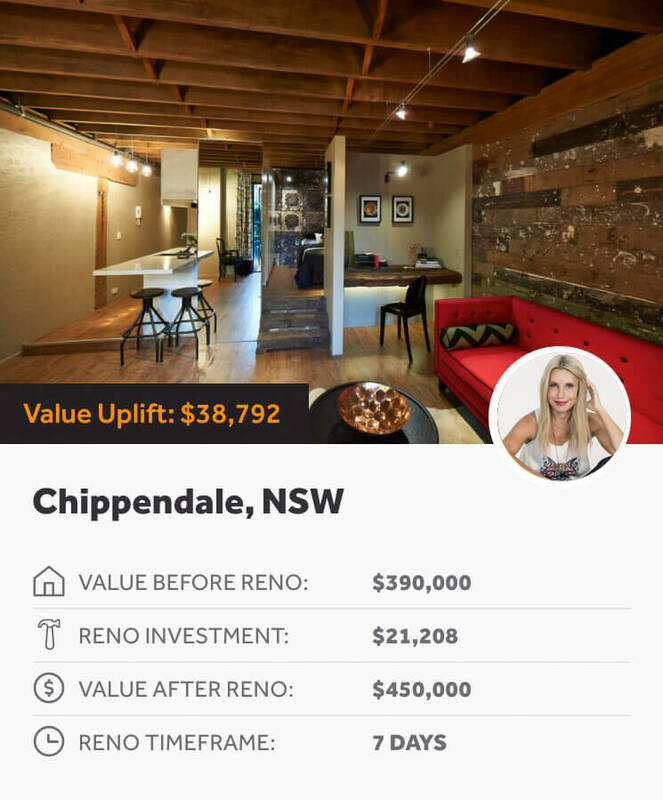 With a templated system and structured approach, Cherie teaches you how to bring out a property’s potential and win over buyers or tenants, without compromising on quality. using ‘cookie cutter’ design palettes personally created by Cherie to help you laser focus through your renovation and move quickly onto your next project, without material waste or time lost ‘reinventing the wheel’ on each property. by targeting high value, high return rooms like the kitchen and bathroom and property upgrades proven to add value. Want to know how much of your budget to spend where? Cherie has exclusive formulas available only to students of this course. calculators and checklists designed to make sure you never overpay for a property. Decrease risk and increase profit by following Cherie’s proven formulas, as she reveals the property types and locations you should avoid and those you should snap up fast! Renovating for Profit v4 MASTER from Cherie Barber on Vimeo. Cherie Barber, creator of the Cosmetic Renovations For Profit course, is Australia’s leading renovation expert. She owns the company, she wrote the book, she’s the only true Renovating For Profit expert in Australia. In 2009, after constant requests from people asking how she does what she does, Cherie started her education program. She now hosts Australia’s largest community of renovators and more than 13,500 Aussies have now undergone her training, making her the clear market leader for quality, property renovation education. Learn the strategies Cherie has used on over 117 hands-on renovation projects for yourself. Cherie has renovated for over 27 years and has personally completed more than 117 projects. But it’s not about how many projects you’ve notched up; it’s the expertise you’ve gained from those projects and the figures that prove it. Cherie is proud to say she’s never lost money on a renovation – through red-hot markets and slumps and the results are there for all to see. But above all, Cherie is driven to help others achieve their property goals. Join Cherie and renovate your way to success! Join over 13,500 students who have already been trained by Renovating For Profit! 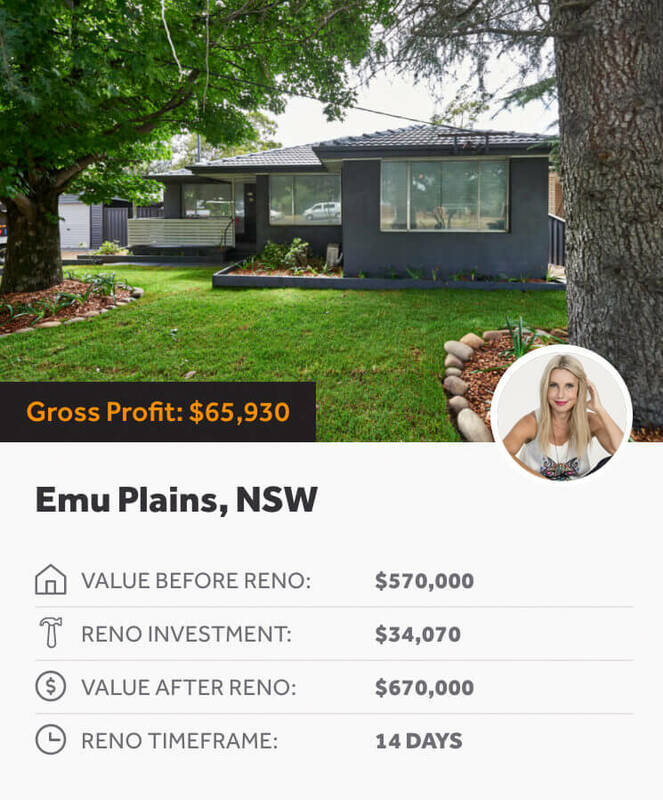 Australia's most comprehensive online course designed to turn you from a beginner investor into an expert Cosmetic Renovator. The course comes complete with video tutorials, downloadable course notes and fact sheets, checklists and templates, plus calculators and project management software. Access instantly, for 24 months from your enrolment date. An intensive 3 Day Live Bootcamp where Cherie teaches the entire step-by-step process of how to cosmetically renovate outdated houses or apartments for maximum profit. Our Bootcamps are capped at 750 students and are held twice a year in Sydney only. You have 24 months from your enrolment date to complete your 3 Day Bootcamp. Cherie's highly trained, professional property coaches will assist you every step of the way through your renovation projects with phone, email and live chat support. Yours at no additional fee, your mentoring starts immediately upon enrolment and completes 12 months from your 3 Day Bootcamp. As a student you'll instantly gain access to exclusive nationwide discounts on renovation services, materials, fixtures and fittings. Take advantage of Renovating For Profit's people power, as you save between 5-15% on a wide range of products and materials from major retailers like Bunnings, Appliances Online, Jims Building Inspections, Taubmans and many, many more! Develop a clear understanding of what type of renovations to embark on with your existing finances and learn the best way to structure your renovating business. Become a ‘suburb expert’ by identifying a small cluster of suburbs to focus your property investments in. Study the market in your chosen area and make informed property decisions every time. 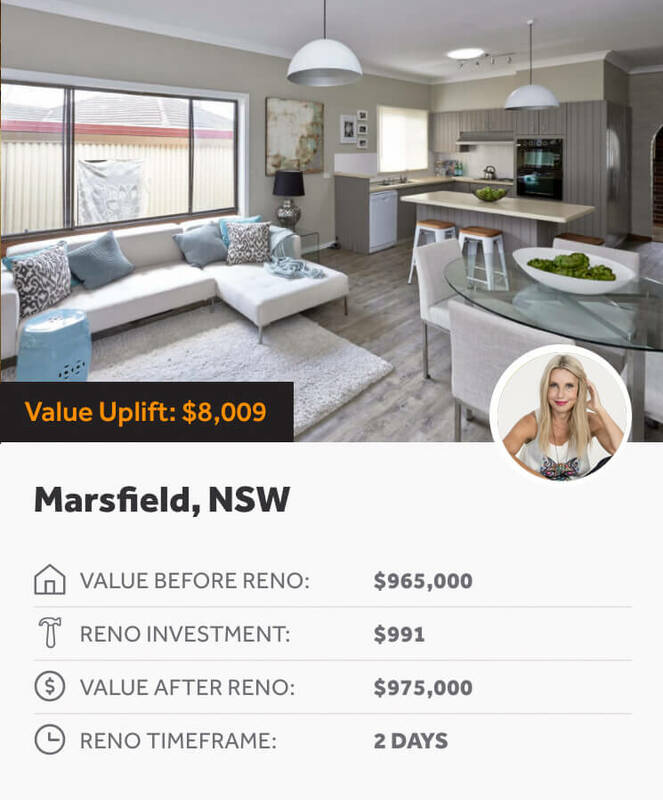 Gain expert knowledge on the prices of ‘unrenovated’ and ‘renovated’ properties in your target suburbs, enabling you to pay the right price when buying and forecast the expected revalue price on completion. Learn to thoroughly research and analyse the potential of a property, before you buy. Acquire properties at the right price and on terms that maximise the profit potential of your projects, whether at auction or private treaty. Obtain formal planning approval (if required) in the fastest and cheapest way possible. Learn how to project manage like a seasoned professional, completing your renovation on time, and to cost and quality targets. Sell your renovated property for the highest price, in the shortest possible time and move on to your next project. Rent your renovated property for the highest rental return, in the shortest possible time, to build your property portfolio. Expert led education delivered online so that you can learn at your pace, anywhere, anytime. Mobile, laptop, desktop and tablet ready with over 36 hours of video tutorials. Custom designed project management software designed to plan ahead and keep your renovation on track so that there are no surprises. Our team of experts supports you every step of the way. Buy, renovate and grow your portfolio with confidence knowing the Experts in Profitable Renovations are by your side. We offer pricing plans that work with everyone’s income. Add partners and save up to 40% per additional student. $	1095 / for 6 months. $	5995 / one time. Q:	Do I need to have trade skills? A common question is do we have to manually do the renovation work? Short answer – no! In fact, we teach and encourage you to use the professional renovation project management strategies to build a great tradie contact list. If you want to DIY, great! Even though Cherie and her star students can and do pick up their power tools, time is money and being able to push through each renovation equals a fast path to property profit. Q:	What are the dates of the 3 Day LIVE Bootcamp? There is just one final chance to book your live 3-day Cosmetic Renovations For Profit Bootcamp with Cherie before she takes her program 100% online … forever! Note – all students fly into Sydney from interstate to attend this event. Q:	Do you need to attend a bootcamp? The live 3-day Bootcamp is beneficial but not critical; there is an online version of the bootcamp which many of our students outside of NSW opt to sit at in the comfort of their own home. You’ll find this inside your Cosmetic Renovations For Profit online course. Q:	Do I need to have lending approved? This is an amateur mistake unfortunately. How can you maximise your lending criteria and do the right due diligence on your property to maximise renovation profit potential? This course is as much about property investment on top of being the most comprehensive renovation course.